The event was well attended with delegates from both commercial and non-commercial organisations. Approximately 450 delegates attended over the two days. The event was hosted by Dr Andrew Gray, Inspectorate Unit Manager (GCP, GLP and GDP) and a number of topics were presented throughout the day. The audience heard first hand from the GCP inspectors the areas of non-compliance continually identified on inspection and how to improve compliance. Gail Francis, Expert GCP inspector started the presentations with an update on the EU Clinical Trials Regulations and where we are currently. A number of guidance documents have been released for public consultation and some are yet to be released (e.g. Trial Master File (TMF) and Serious Breach guidance). Organisations can prepare for the upcoming regulations by getting involved with the public consultations that will be published on the EU Commission and EMA websites. User Acceptance Testing (UAT) of the portal is currently underway; if you are interested in getting involved in the UAT, you need to do this via a professional organisation such as EFGCP and ACRO. Andy Fisher, Senior GCP inspector presented the issues still encountered by inspectors with provision of the TMF and how it is not always in accordance with Regulation 31A of the SI 2004/1031 (as amended). Andy mentioned inspections are being impeded by the TMF being incomplete, despite numerous guidance available (see the inspectorate blog on TMF for further information). It is important that organisations are aware of all the documents which comprise the TMF and where they are located. If located in different locations then the locations should be formally specified and the TMF reviewed in its entirety as to how it will be presented to inspectors and how the documents will be archived as a complete TMF. A change in organisation culture and mind-set is required as it is often seen that the TMF is treated as the end of trial archive/ repository and not a living file used during the trial. GCP Inspector Balall Naeem and Senior Medical Assessor & Deputy Manager (CTU) Dr. Kirsty Wydenbach informed the audience of the current issues seen in relation to the use and control of RSI. It is important that the RSI is clearly defined within the quality system and there are processes to control the RSI and ensure updates are approved by the MHRA as a substantial amendment prior to implementation. Balall has written an inspectorate blog on the RSI and part two to this blog will be coming soon. The take home message was to ensure that you are aware of CT-3 guidance. Jennifer Martin, Acting GCP Operations Manager and Senior GCP inspector presented the importance of sponsor oversight and how this can be achieved. A blog on this topic is also imminent so further information can be found there. Some take home messages were to ensure that you retain evidence of oversight within your TMF as this will be reviewed upon inspection and delegation of duties does not negate the fact that the sponsor has overall responsibility for the trial. GCP inspector Hayley Dixey presented on how to produce effective CAPA and ensure that findings/ issues are truly resolved. Hayley had a unique perspective on the topic having hosted GCP inspections where she was responsible for proposing and overseeing CAPA. An ineffective CAPA can result in findings being upgraded at the next inspection if not adequately resolved. Therefore be sure to truly think about the issue, identify the root cause and perform an impact assessment as to how wide it is. Retraining and human error alone are not suitable responses and as Hayley mentioned, if you’ve stopped at human error as your root cause, you’ve stopped too soon! Kathleen Meely, Senior GCP inspector presented an informative session on Data Integrity and the mechanisms by which this can be achieved. Data Integrity is becoming an increasing focus of the inspectorate with the use of more computerised systems in order to conduct trial activities. The inspectors are reviewing audit trails on inspection and identifying issues which the organisation was unaware of. Ensure systems have audit trails and that these are reviewed. 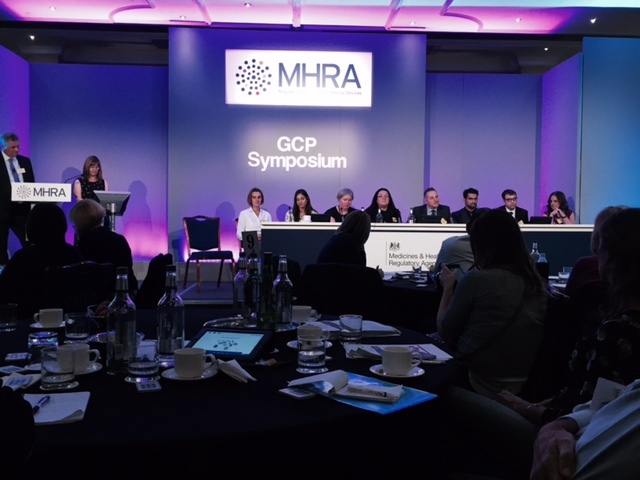 The MHRA inspectorate currently has a draft GXP document on Data Integrity released for public consultation. The audience had the chance to ask the inspectors questions throughout the day during the inspector surgeries and during the panel session. If your question was not answered, it can be submitted via the Clinical Trials Helpline. Thank you to all who attended this year. We hope to see you again at next year’s symposium.